In September 2017, Beststart HR will be celebrating our 10th Anniversary. As part of this celebration, we chose to support a young, talented athlete who would reflect our company’s values. Someone who would be passionate in their attitude, have an ability to approach challenges openly and flexibly, and above all else, possess a desire to reach their full potential. 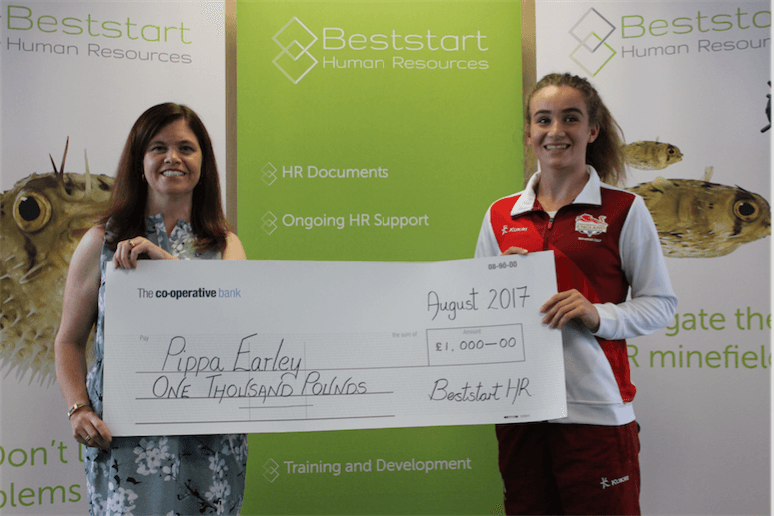 Following discussions with SportsAid, a charity which provides financial support and recognition to the country’s brightest sporting prospects, we were delighted to select Pippa Earley, aged 16. Identified as someone who would embody the company’s values and capabilities, Pippa is a talented all-rounder from the Kingston AC & Polytechnic Harrier Athletics Club. Having being selected to represent Great Britain at the Commonwealth Youth Games, recently held in the Bahamas, we are pleased to report that Pippa secured fourth place in the U18 100m hurdles. She is currently the England National Indoor Pentathlon U17 women’s champion and was previously coached by two-time Olympian, Lorna Boothe. Pippa’s sporting idol is Dame Jessica Ennis-Hill, who was supported by SportsAid as a 15-year-old, and Pippa also competes in the heptathlon.